St Mark’s church was built 1895-1898 to the designs of Henry Wilson. It is one of the few full bloodied Arts and Crafts churches in Wales, and is listed Grade I. The church was paid for in memory of the Rev’d Charles Tooth, chaplain and founder of St Mark’s English Church in Florence, and is particularly important for the boldness of its architecture and the wonderfully naturalistic detail of its fittings. Inside the church, the visitor is transported from the rugged Welsh countryside to a warm Mediterranean clime, with red ochre walls and a ceiling of vivid blue sky. Let the eyes adjust and notice the decorated font at the west end, conceived by Wilson, modelled by Arthur Grove and made by the Central School of Art in London. At the east end the pulpit and altar are characterised by their intricate naturalistic Arts & Crafts detailing; both designed and (unusually) made by Wilson himself. 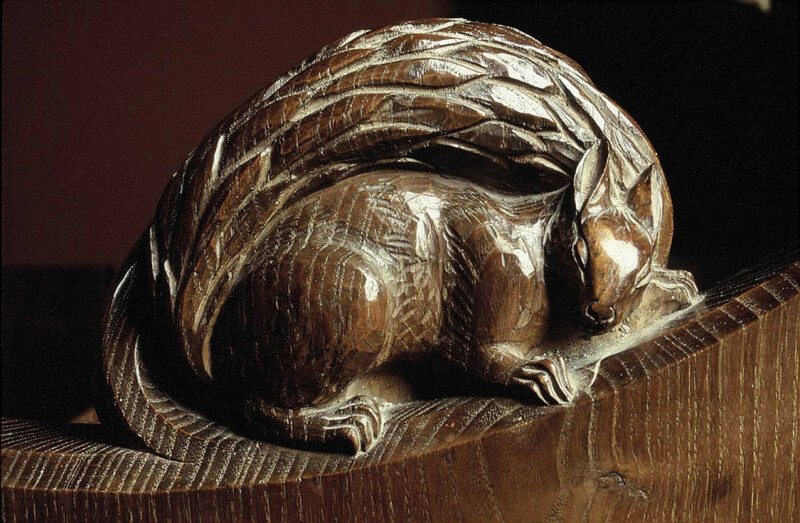 The choir stalls are beautifully carved with a hare, tortoise, squirrels, rabbits, an owl, a mouse, a kingfisher and a dolphin. Outside the church, do notice the rugged rustication on the lower courses of stone at the east end. In fact research has shown that all the external stonework was intended to be left ‘untooled’ (rough); the architect’s dream being that “the Church [should] appear is if it had sprung out of the soil.” This was such an alien notion, it seems, to his builder, that he would not (or could not) undertake it! Look also on the exterior for the massive splay at the east end, the intricate, Art Nouveau window leading (cames), the door hinges of organic form and the sweeping cat-slide roof over the porch, a characteristic Arts and Crafts device. The great canopy at the west end shelters a stone cross in relief.